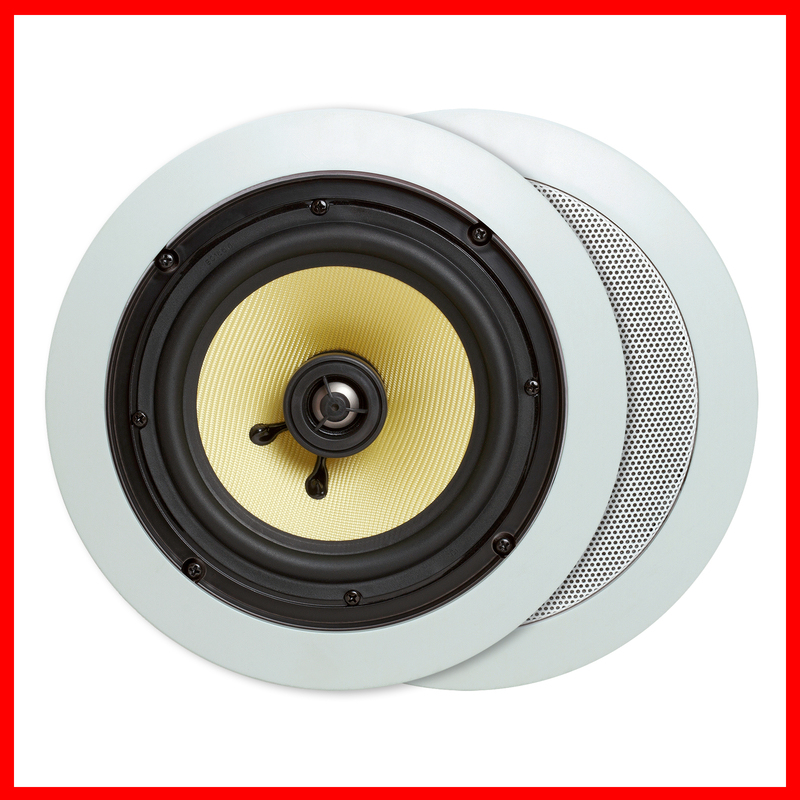 Our new line of products is a superb in-wall and in-ceiling speakers. 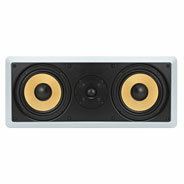 They are perfect for use in mid- or large-sized rooms, both for home theater and for high quality complete house audio. The 6.5" Kevlar cone woofer produces profound mid and low frequencies and the titanium dome tweeter blends well to produce a clear and crisp sound. Kevlar is a supreme material, because it is lightweight, yet extremely rigid. Lightness and flexibility of the cone means the speaker can move faster which is significant for accuracy and detail of the sound. Rigidity is giving fewer warps during movement resulting more precise performance. Like all of our speakers this pair includes a tweeter that swivels 35¡ each side. This allows the highest, most directional frequencies to be pointed at the primary listening area while allowing the speaker to maintain its flush-mount appearance. Tone is controlled through separate +/-2dB switches for both the high and low frequencies. This feature allows you to customize the sound to your room and personal taste. In addition, these speakers are suitable for use in high moisture areas, such as bathrooms with showers or outdoors as long as the speakers are installed where it is not hit directly by the water. 3 Pair 5.25" 1 Piece 2 x 6.5"
Kevlar Woven Cone. This is a flexible material which demonstrates an irregular style of break-up behavior, typically not found in more simple-designed materials. Kevlar keeps a more continuous dispersion pattern at all frequencies in its range, transmits far fewer delays and less smearing sounds. Furthermore, Kevlar provides you with better sound than other materials around, especially in the critical midrange frequencies. Gold Plated Push-Type Terminal. This terminal allows you to connect and disconnect your wires very easily. In addition, this terminal has a color coded heads (black and red), so you'll never make a mistake when connecting the wires. Gold plating feature is important too, because gold has a very good conductivity and prevents corrosion. All of that make our speakers very durable and long lasting. 3-Position Switch. This feature is pretty rare and normally can be found only on much more expensive speakers. The switch controls the tone of the tweeter. You can set it up for -2dB, 0dB, and +2dB. This allows you to customize the sound to your room, working environment or personal taste. The switch is located on the back of the speakers', so please make sure that you have evaluated the speakers sound before mounting them into the wall. A Dome Tweeter. The Dome Tweeter goes with 3-positions switch for sound tone control. You can set it for +/-2dB range for both the high and low frequencies. Our tweeter is featuring an absolutely linear frequency response and crisp high-range reproduction with excellent omnidirectional sound distribution. Silk was used as a dome material that provides you very natural sounding when the tweeter reproduces high frequency sounds.